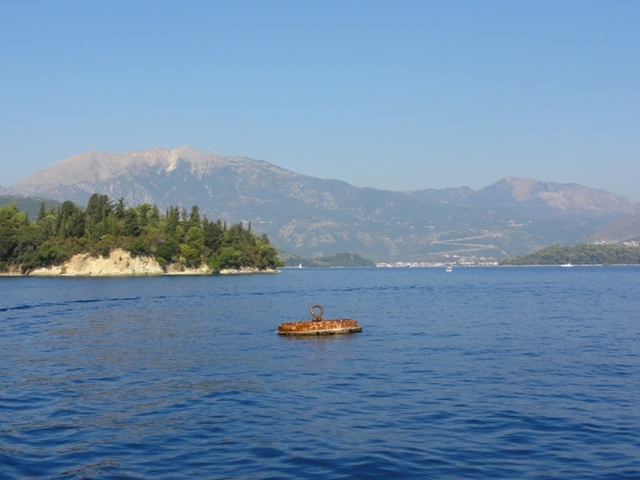 Leaving mainland Greece at Katakolon the end of July we started working our way up the Ionian islands, revisiting several harbors that we first saw in spring 2009. 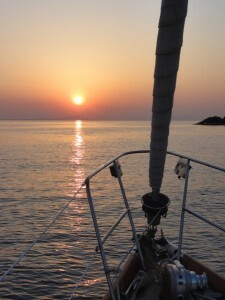 I wanted to be in Corfu for our anniversary, on August 31st so we had nearly a month to travel about 160 NM. 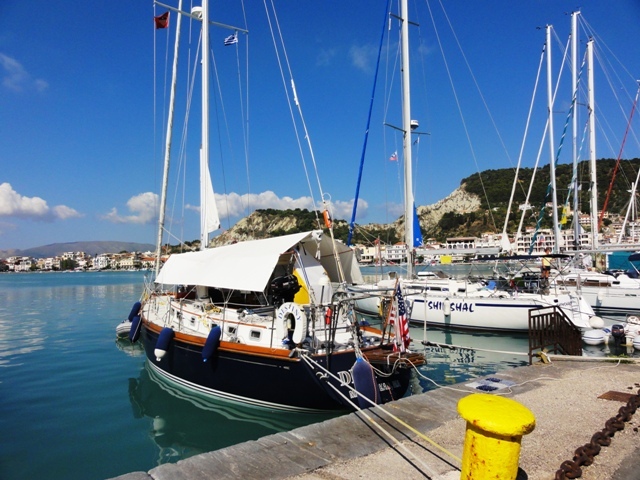 Our first stop was the town of Zakinthos on the island of the same name. The town has several lovely squares and already we are seeing the Italian influence in architecture. 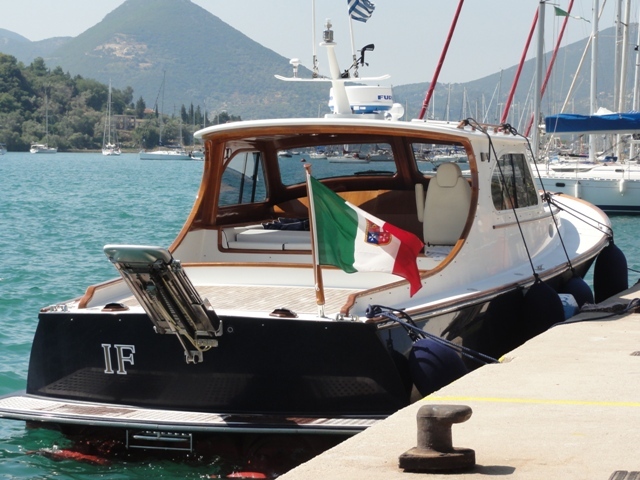 Overall, the Ionian islands are more Italian than Greek. Not surprising, given that they were part of Italy until the early 20th Century. 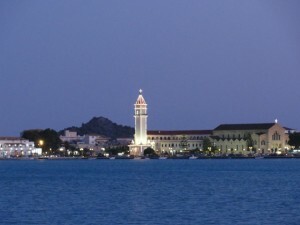 The town comes alive during the evening when families stroll the squares and children playfully dart around. . . .while at St. Marco Square families stroll in the cool evening air. 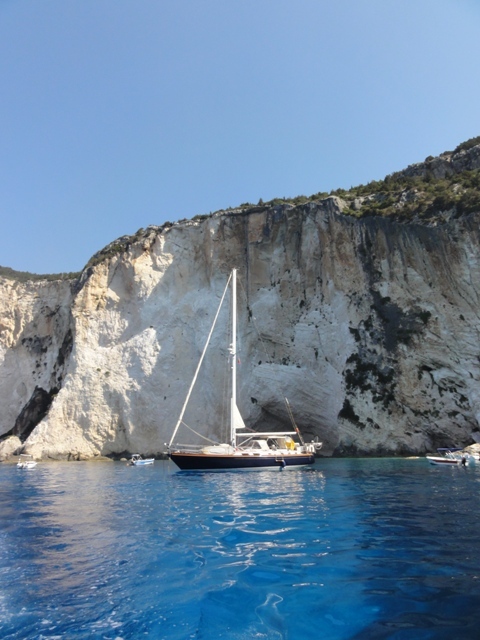 We made a return visit to the tiny harbor of Nikolao on the north tip of Zakinthos and took the dinghy to the “Blue Caves” that are a touted tourist attraction. 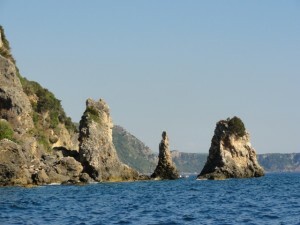 Unlike our last visit it was warm enough to snorkel in the azure water and see amazing rock formations below the surface. The ocean bottom is like a moonscape. We saw some colorful fish as well—unusual for the Mediterranean. 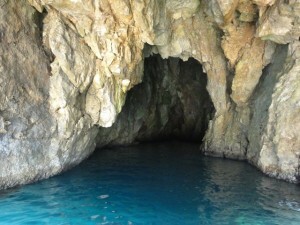 See: “Move over Capri, Greece has Blue Caves Too”, August, 2011. 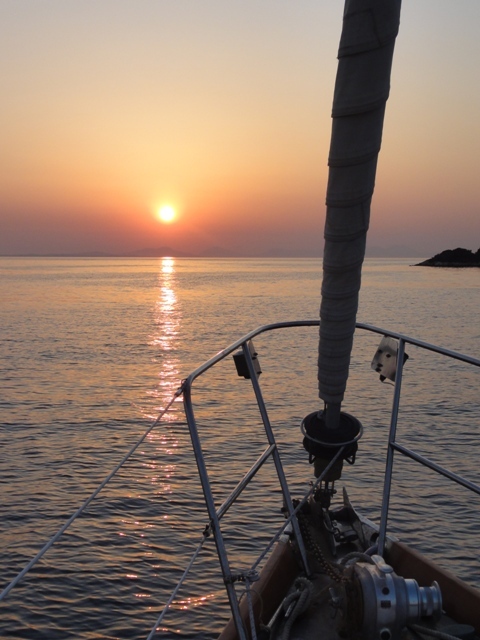 Since the wind is primarily N and NW this time of year, and we are heading north, criss-crossing between the islands is the only way to get some sailing in. 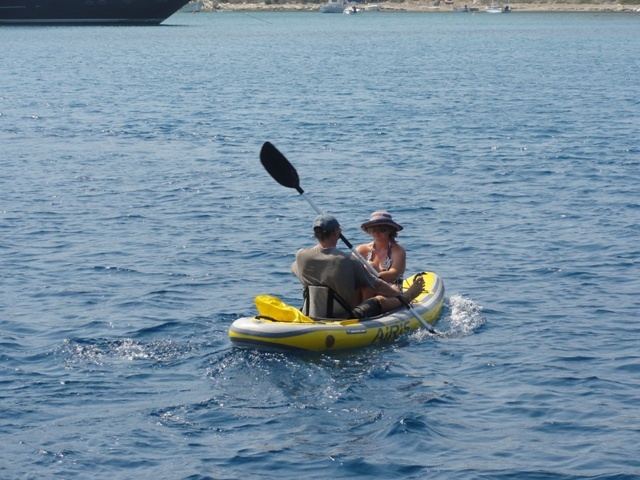 Although we managed to sail a portion of each day, we are spending more time “motor boating in the Med” as Kent calls it. Everyday he sets sails and takes them in when they don’t carry. Frustrating but good exercise. 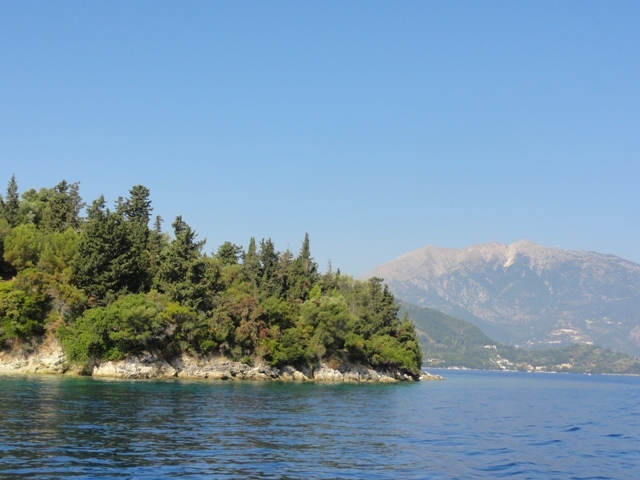 From Nikolao we headed across the Cephalonia Straits to revisit the island of Ithaca where we spent two nights at anchor. The first night we anchored in a lovely bay just at the entrance to the gulf and the second in the harbor where there was access to both a bakery and an ATM. The town of Ithaca is a popular destination for charter boats, and quite busy this time of year. 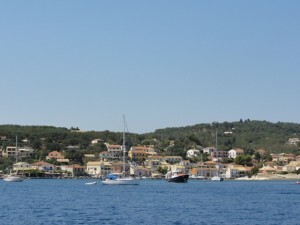 Enroute to the Levkas Canal we made stops in Sivota and Tranquil Bay an anchorage just opposite the town of Nidri on Levkas. 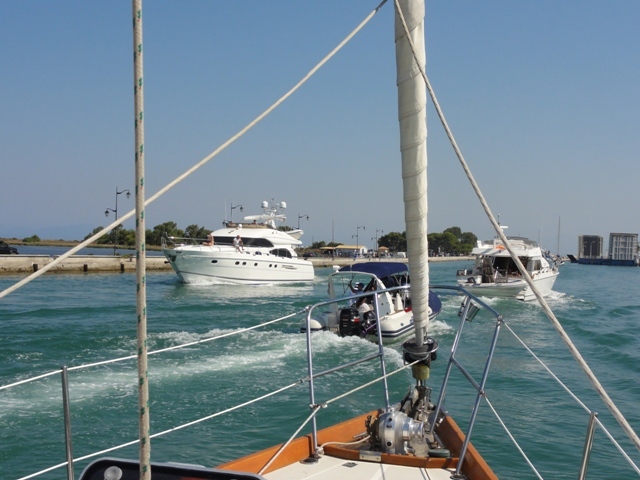 We spent several days enjoying the company of friends Martin & Sandy on S/V Mystique and Ted & Pam on S/V Rahda who are also enroute to Marina di Ragusa for the winter. The Nidri Quay is a desirable place to be. . . IF you can find a spot. Nidri sits just across the Meganisi Channel from the Onassis family island of Skorpios which we passed by there enroute to an anchorage on Meganisi. The island is meticulously maintained with manicured grounds, several quays and small beaches. Skorpios looks like a large, well maintained park. . .
that people pay money to see from a boat, but can't set foot on. Boats a permitted to anchor off the island but can’t land. 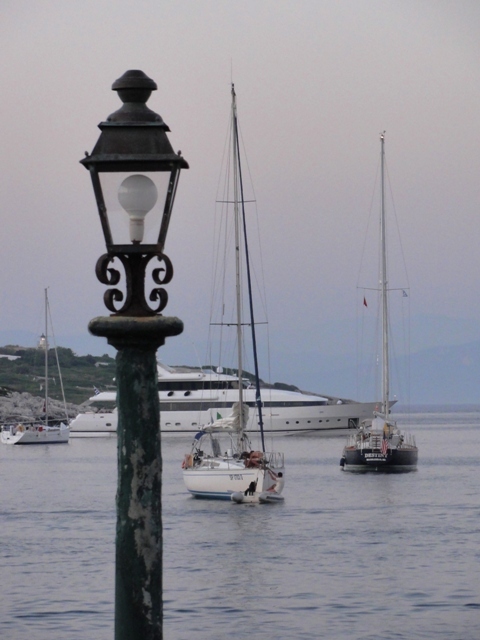 The rusty ship mooring that once held the Onassis mega-yacht “Christina” is still in place. Meganisi is a fjord-like island with numerous anchorages and several small towns separated from Levkas by a channel. 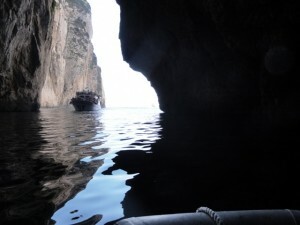 The Meganisi Channel is considered one of the prettiest passages in the Med. . .
with low lying fir covered islands framed by mountains. Day trip boats from Nidri bring tourists here to view the island and swim. 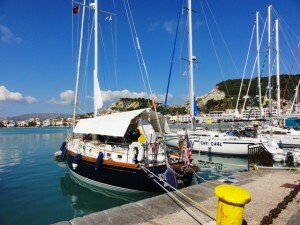 We spent one rather blustery night anchored with our stern tied to shore before returning to Tranquil Bay. Off the point just outside our anchorage a mega-sailing yacht went aground and the efforts to get her off the reef provided “entertainment” for about eight hours. It was well after dark before several fishing boats acting in concert were able to free her. 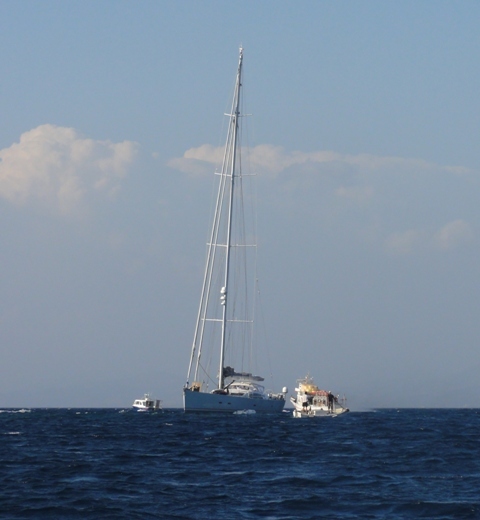 We couldn’t help but feel sorry for the captian and crew as “heads were likely to roll” over grounding on a well marked reef at mid-day. We left Nidri for the Levkas Canal in mid-August. Having made the passage south through the canal we had some idea what to expect. The canal is fairly shallow and marked with stakes that don’t look like they have been replaced for many years. Boats going north or south inch along like ducks in a row at 5kts. or less until arriving at the swing bridge that connects Levkas to the mainland. The bridge opens on the hour, so you have to time your arrival according. Even then boats circle just off the town of Levkas waiting for the bridge to open and then it’s every captain for himself. 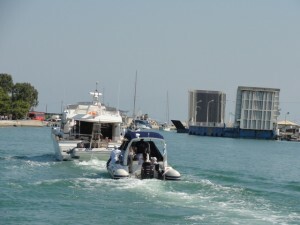 The "parade" forms for passage through the bridge. . .
and some people have no patience once the bridge swings open. 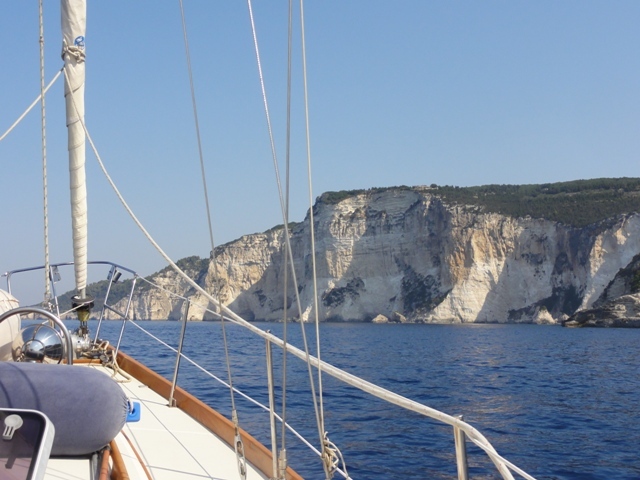 . .
We planned to stop next at Gaios on the island of Paxos which is directly south of Corfu, but as we motored out of the Levkas Canal the wind was more favorable to sail up the mainland coast. Kiriakis an out of the way harbor that barely gets a mention in our cruising guide, was a quiet anchorage where we celebrated the beginning of our “adventure” on August 14th. The surrounding cliffs are a dramatic backdrop for rocky outcroppings at sea level and numerous caves. With the both the wind and Paxos west, we headed north in light winds under gennaker part of the way. 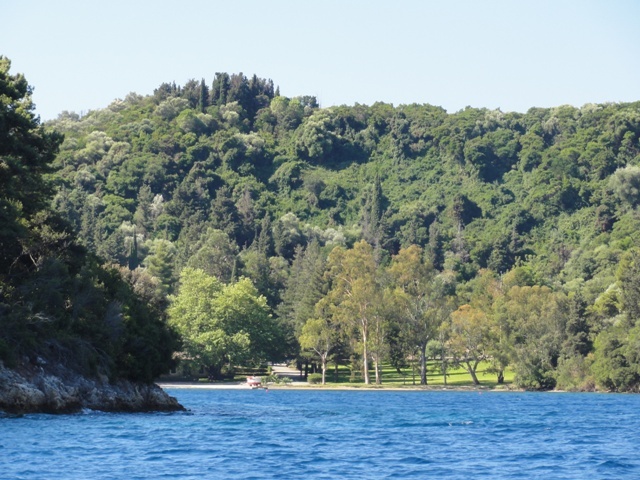 We anchored just off the Old Town of Corfu in Ormos Kammeno where we were surrounded by the Opti fleet from the local sailing club. Optis are universal. 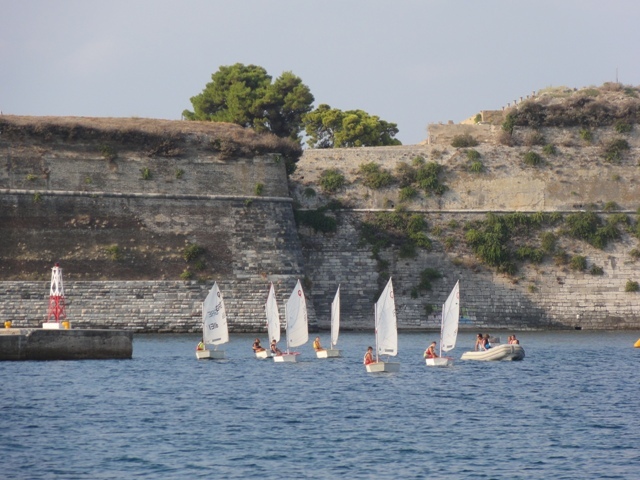 We have seen Opti fleets in Croatia, Italy, Greece and Turkey. Opti fleet off Corfu with Fortress in background. The following day we moved to an anchorage just outside Gouvia Marina because we needed a repair to our refrigeration which had stopped working several days before. There was another US boat, S/V Glide anchored nearby and Kent stopped by to say “hello” and met Brian, Lisa, and children Max (nearly 18) and Gina (age 16) who hail from California. 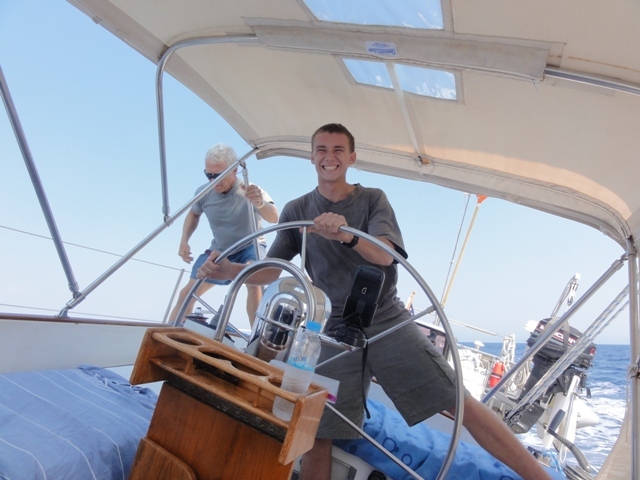 They have been circumnavigating for over 8 years, and Brian just happened to have some knowledge about refrigeration having owned a boat maintenance business. More importantly, he had the tools needed to do the job. This fortuitous meeting got our refrigeration working for FREE and allowed us to make new friends at the same time. 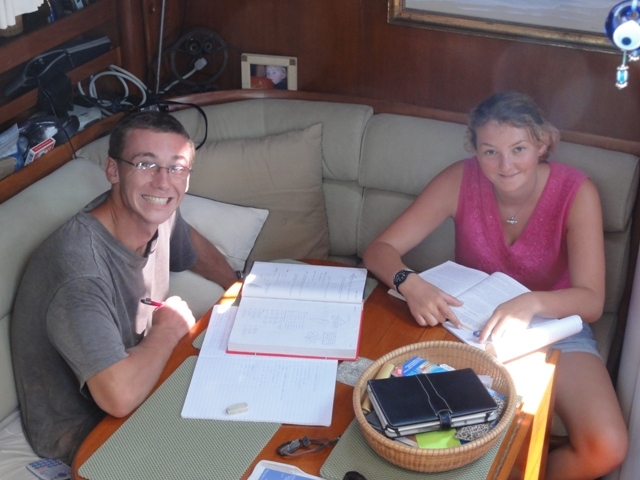 In fact, we enjoyed the company of Max and Gina so much we asked them to go sailing with us for a few days, giving the entire family some extra space. Max handles the wheel while Kent adjusts sail for a rip roaring ride to the island of Othoni, north of Corfu. Max & Gina hit the books everyday--they're both home schooled seniors. There was also some time for kayaking. 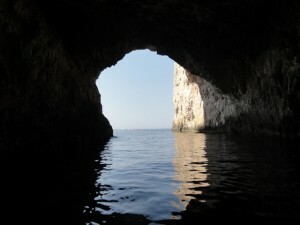 . .
snorkeling in caves. 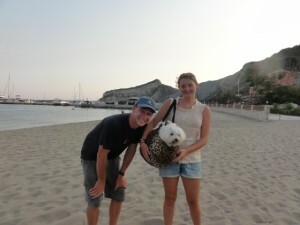 . .
and walking on the beach with Jolie. 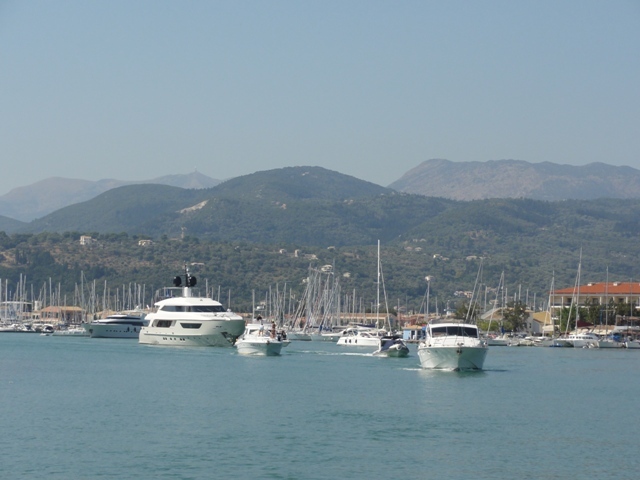 After Max and Gina left us at Corfu we topped off the diesel tanks (avg. 1.52 per liter or just under $6.00 per gal. ), filled the water tanks and were off again backtracking to Paxos. Again the wind said go west and then back east, so we visited the mainland harbor and islands at Mourtos where we were treated to a picture perfect sunset. Nicklolaos Island sits very close to the town of Gaios on the island of Paxos. In fact, the distance between the island and town is so narrow it resembles a river which makes navigation particularly challenging. 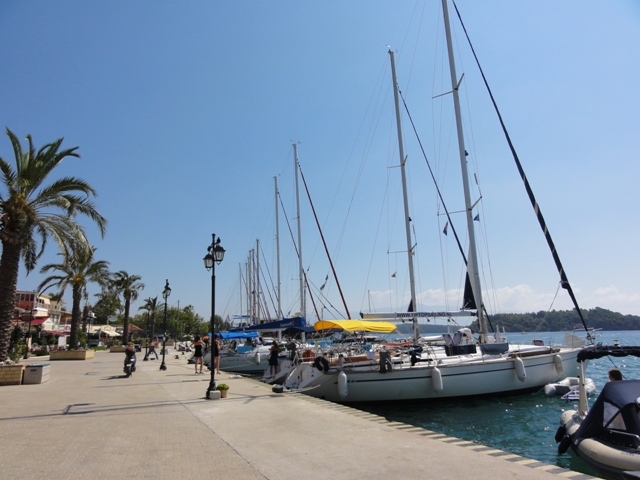 While the quay is very protected as a result, in settled weather anchoring just south of the island is cooler. 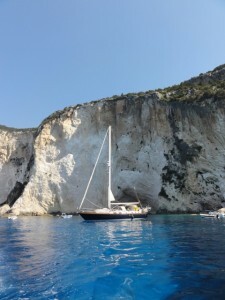 It took two tries to get the anchor to set in a hard bottom but the setting was lovely and we could swim off the boat. 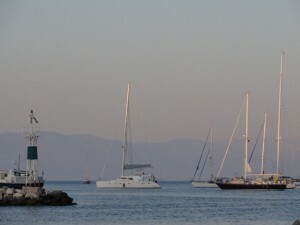 Anchorage off Gaios. . .
became more crowded as dusk fell. . . 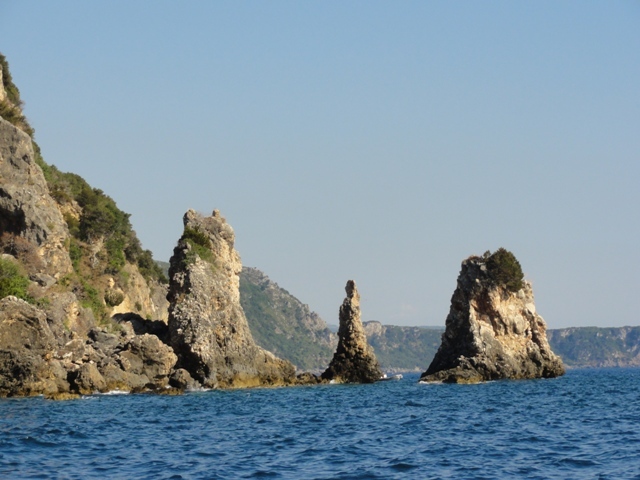 The next day we set out to see the whole of Paxos by heading south around the bottom and then up the west coast to see several caves mentioned in the cruising guide. The west coast of Paxos is miles of sheer rock, dotted with caves. 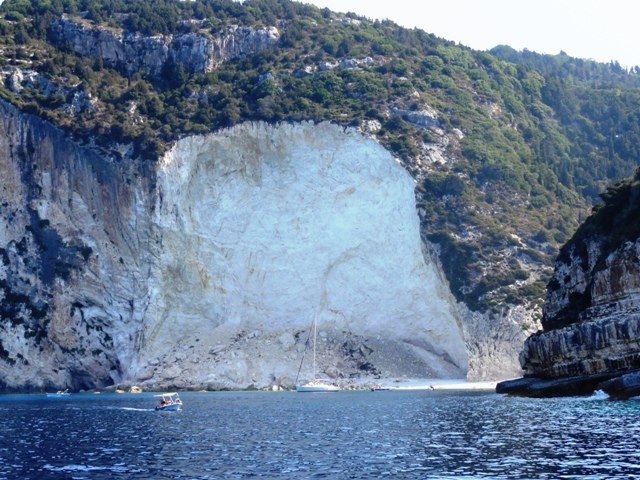 Limestone cliffs of 300-400 ft. dominate the west coast of Paxos. 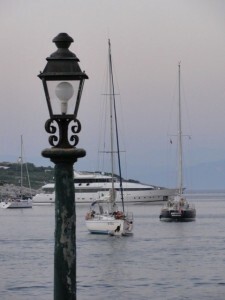 . .
and create a clam shell like backdrop dwarfing a boat anchored. . .
where Destiny drops in for lunch. 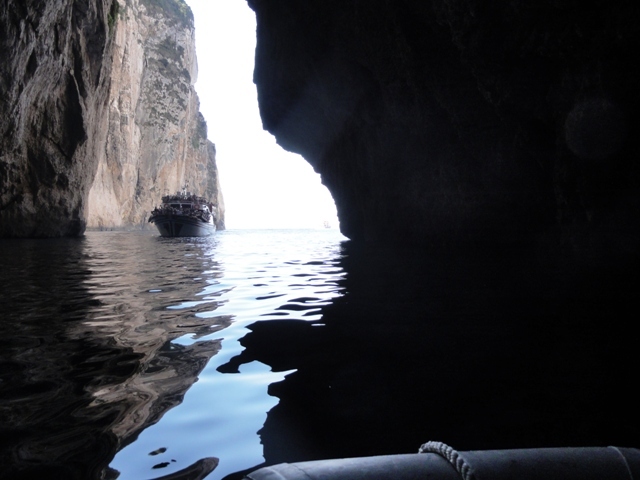 We stopped for lunch off a sandy beach and launched the dinghy to tour the nearby caves. We were amazed by the size and depth of some of the caves, which are clearly among the most spectacular we have seen anywhere in the Med. Some of the caves were quite deep and we worried about bats. 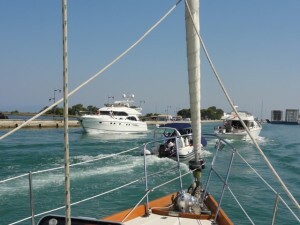 . .
while in others we worried about getting trapped by a large tour boat. 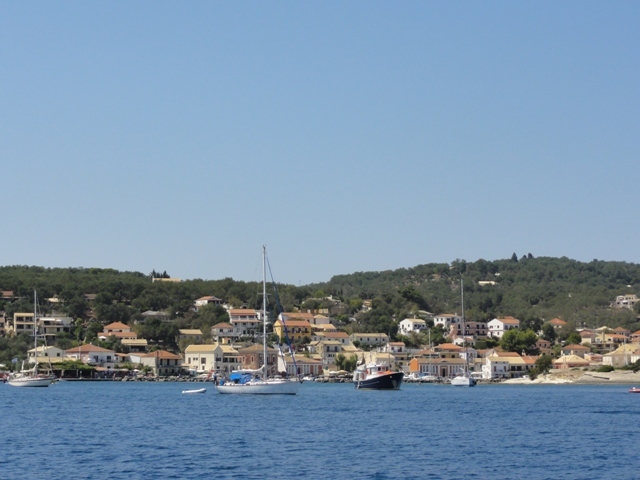 After lunch we headed for Lakka a small harbor on the north end of Paxos where we again met up with S/V Mystique and S/V Rahda and enjoyed dinner ashore. 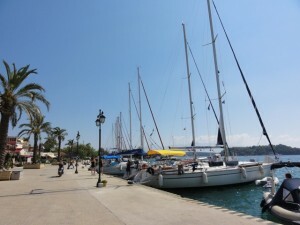 We were last in Lakka in April, 2009 when we were one of three boats in the harbor. 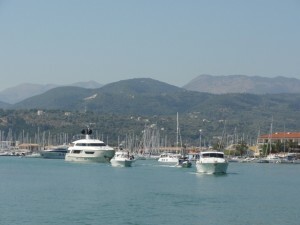 During August there are 80-100 boats in the same space, not to mention small ferries coming and going. 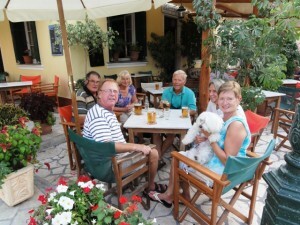 Dinner ashore with cruising friends, Martin, Ted, Pam and Sandy. . .oh yes, and Jolie! 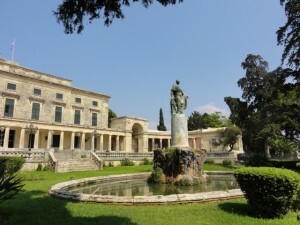 We returned to Corfu for several days before our anniversary (post “Blissful Anniversary”) to enjoy free outdoor philharmonic concerts at the Victorian bandstand that take place on Saturday and Sunday evenings in August. On Sunday we attended a service at the Trinity Anglican Church then visited the Palace of St. Michael and St. George which now houses the Corfu Asian Art Museum. Castle of St. Michael & St. George. . .the inside is equally impressive. Having celebrated our anniversary it was time to start heading to Naples where we meet Kent’s son, Spencer and family on September 20th. After a night at Mandraki Y.C. just under the fortress we checked out of Greece. 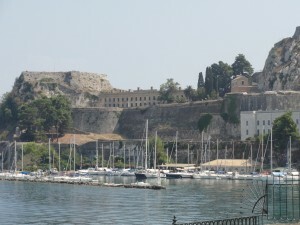 Mandraki is the ancient harbor and you pass through the Fortress to get to the town. 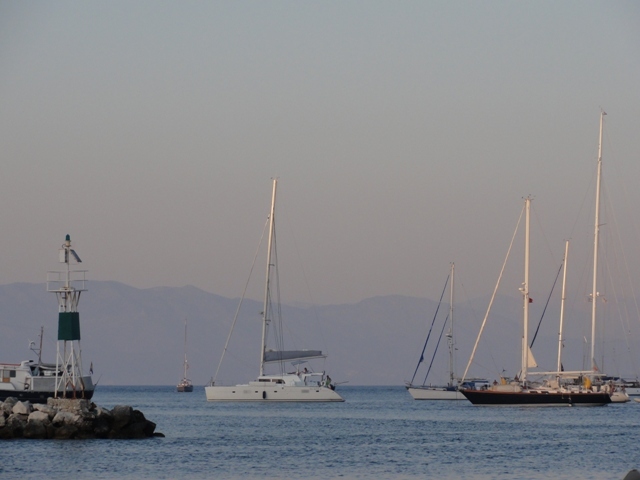 From Corfu to Naples is approximately 516 NM. 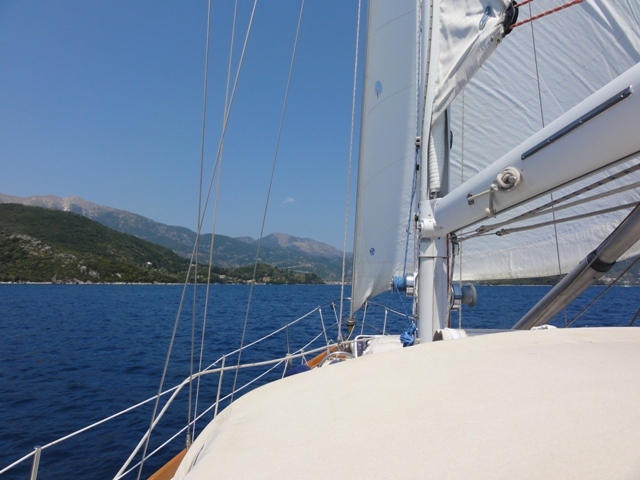 Our first hop in the trip is to the island of Othoni just north of Corfu, and after an overnight there we made a 70 NM passage to Santa Maria de Lueca. From now on La Dolce Vita. . .more adventures to follow in Italy.